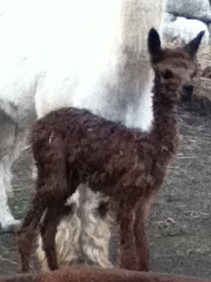 Here is our new alpaca baby, a sweet chocolate brown girl weighing in at 15 pounds, born just after 4:30 this afternoon! Autumn is just about upon us once again. Here in Southeastern MI we’ve had some pretty chilly nights and even some crisp days. The daylight hours are getting shorter, the tops of the trees are showing some color and the summer gardens are just about done for the season. With Mother Nature at her finest (at least for me) many are preparing for a long cold winter. Usually around this time of year, many people start questioning how to keep their animals warm and comfortable thru the winter. I have found the 1 animal most people seem to be concerned about is the wonderful Chicken. I remember my first winter as a chicken keeper. It was scary to say the least. I remember that first really cold night. The temperature dropped down to a very cold 12 degrees! I only had 2 large breed hens then and I loved them so. I couldn’t bear the thought of them freezing to death out there. I thought about bringing them in the house for the night. I even got up once in the middle of the night and went out to check on them. I found them huddled together as tightly as possible and they looked cold. Several more hours passed till morning came and I jumped out of bed and ran out to the coop, afraid I was going to find to frozen stiff chickens. I opened the coop door (only a brisk 17 degrees now) and out they came, happy as can be! They didn’t seem to care one bit that is was very cold outside. After that first night, I thought and thought about different ways I could keep them warm without heating their coop. Truth of the matter is, large breed chickens are more tolerant of the cold than the heat. I had a small coop with a removable roof so I insulated it with straw by simply tying sections of straw to the roof panels on the inside. I also stuffed the coop with layers of straw and pine shavings up to about an inch below the roost. Picture a space about 3×3 feet packed with straw with only enough room for the girls to get to their roost and to the net box and leaving the vents clear. Most nights I would find a thin layer of ice in their waterer, but it was thin enough for them to easily break thru if they got thirsty. That was a sign that even though the outside temps were well below freezing, the straw stuffed coop was staying relatively warm with just the 2 hens body heat. I didn’t worry after that. I also have a chain link run for the girls during the day that I sided with left over vinyl siding I had on hand from siding the house. I sided the North, West, and East sides of it and half the roof was also covered. This helped shield them from the brutal winds and weather. Al winter long they pecked their day away, comfortably. ***Note: This has nothing to do with keeping chickens warm in the winter but if you still want to have fresh eggs every day, you will need to add supplemental light (not a heat light). This can be done by simply hanging a 100 watt light in your coop or run and turning it on either a few hours before sunrise or to extend the day after sunset. There is some varied opinions out there as to whether it is best to add extra light in the wee morning hours or at night. I personally do not have a timer….yet, so I extend the daylight hours for them at night. Just before it starts getting dark I turn their light on until I’m ready to go to bed, at which point, the girls go into their coop where I have an orange colored sensor light that goes out rather quickly. This helps to ease them into the dark hours. I have not experienced any problems or issues adding light later in the day, nor do my chickens show any signs of being stressed by it. The important thing in any circumstance is to carefully observe your flock. What might be good for one person’s flock may not be right for another’s. Watch, observe and modify as you see fit to meet the needs of your beloved feathered friends. 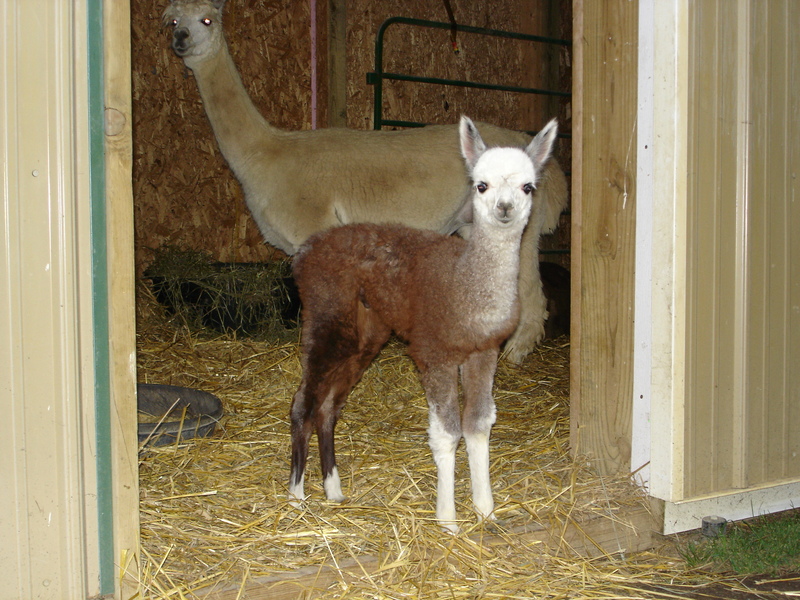 2 weeks from today our lovely alpaca “Buffy” is due with her 6th cria and we are so excited! 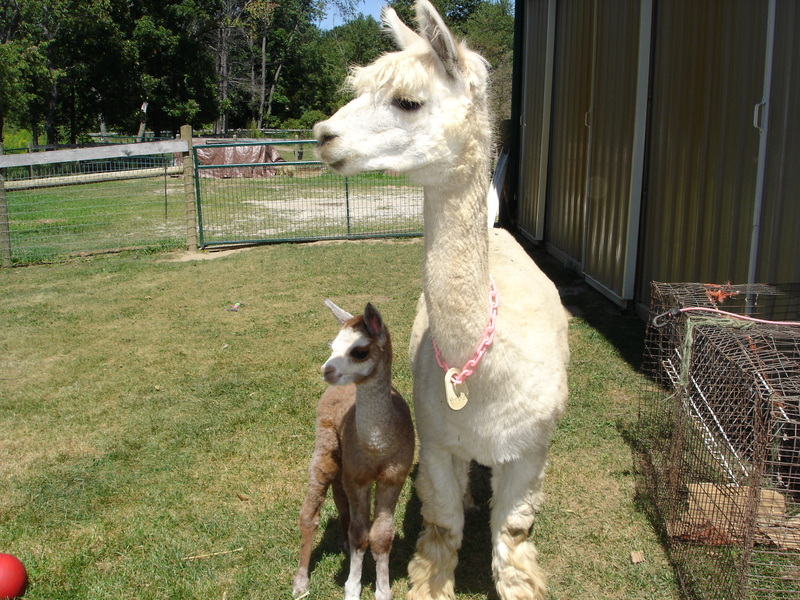 What is a cria you ask? 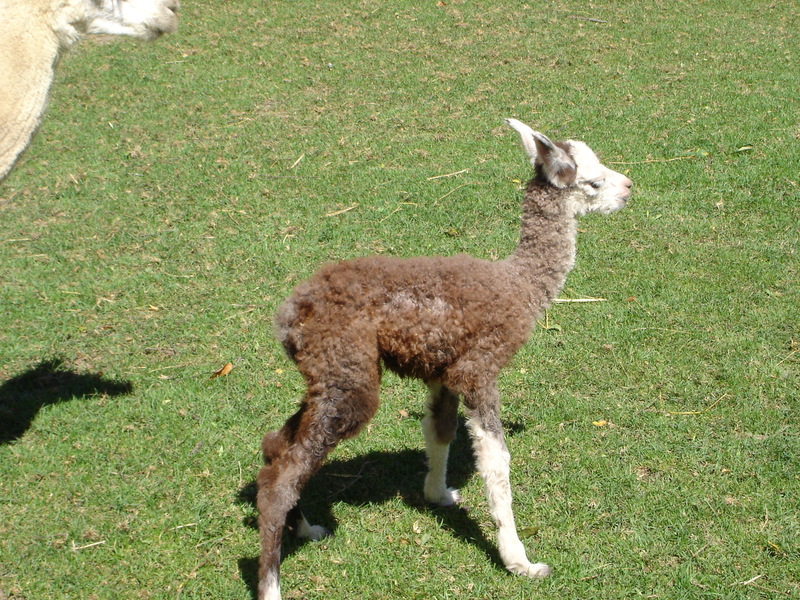 A cria (pronounced CREE-AH) is a baby alpaca. Let me tell you a little bit about crias. 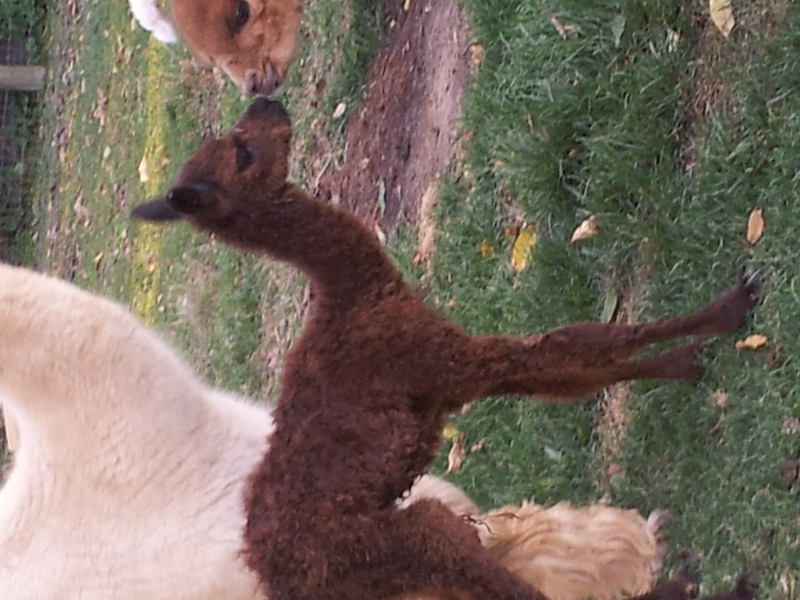 Gestation in alpacas is a long 11 months! Can you imagine! When crias are born, they remind me of horses, they are all legs. Newborn crias can weigh on average between 14 and 18 pounds at birth. They are usually up and walking, more like wobbling, around in about an hour after birth, nursing soon after. It is very rare for an alpaca to give birth to twins. Crias stay close to mom for the first 6 months, but can wean earlier. I just love crias, they are so playful and so curious, just a joy to watch out in the pasture. 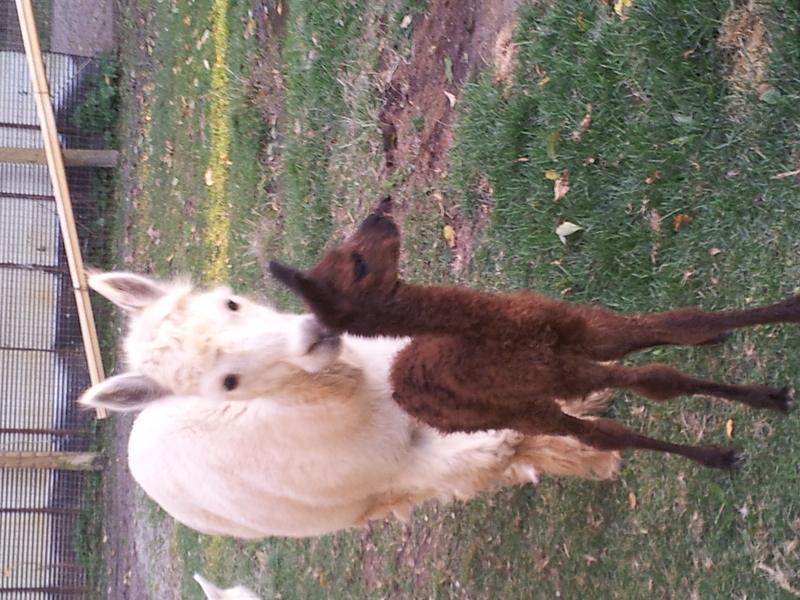 About 3 weeks after giving birth, Momma alpaca is already ready to conceive again!! I am so happy I am not an alpaca!! This is their natural way of life. Just up! First time up on her feet! Look at our visitor last night! Scary stuff when it’s sitting less than 5 feet away from my 17 chickens! There are more than 60 different species of opossum, and it’s the only marsupial (pouched mammal) found in the United States and Canada. A female opossum gives birth to as many as 20 babies in 1 litter. Her young are as tiny as honeybees. However, less than half of them survive. Some never even make it to the pouch. Once born, babies immediately crawl into the mother’s pouch, where they continue to develop. As they get larger, they will go in and out of the pouch and sometimes ride on the mother’s back as she hunts for food. Opossums are scavengers, and they are often found near garbage cans, and dumpsters. They can often be spotted near roadkill. They are a common city dweller. Opossums also eat grass, nuts, and fruit. They will hunt mice, birds, insects, worms, snakes, and even CHICKENS! 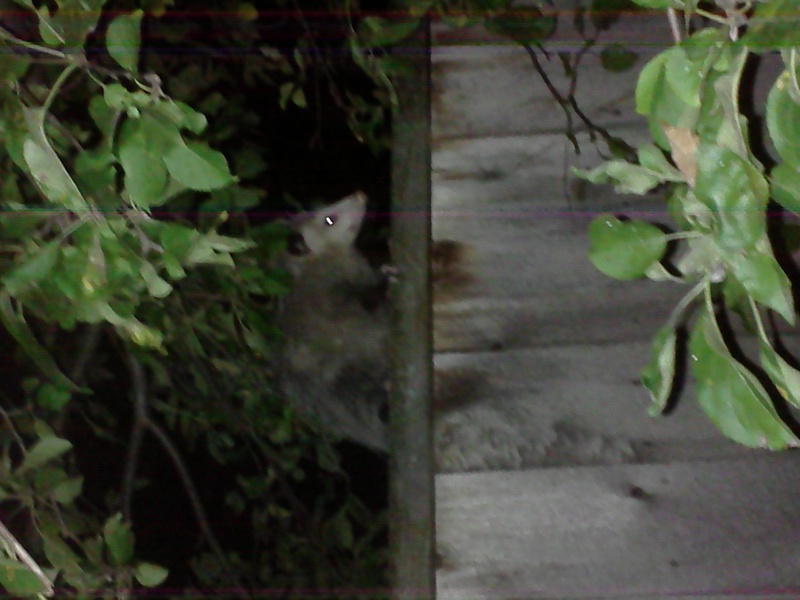 This opossum was definitely looking for a chicken dinner! I can not stress enough how important it is to predator proof your chicken coop and run! Mine has been put to the test several times, this summer alone! Thankfully my feathered friends stay safe up on their roosts because this guy doesn’t stand a chance on getting in! The incubators have been very hard at work for several months now, but the time has come to store them away:( It makes me sad, yet a break from hatching, setting up brooders, moving chicks to the outside playpen, introducing them to the rest of the flock and selling chicks, is a nice change. 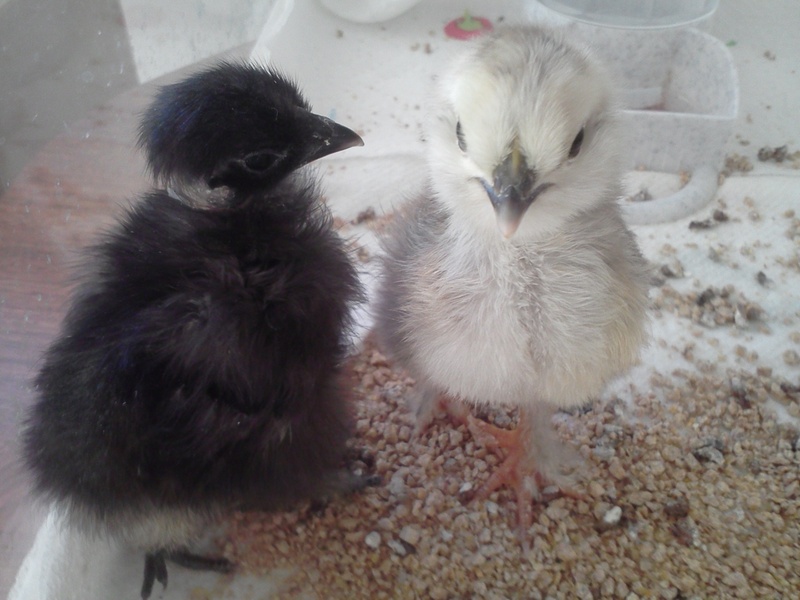 The last to hatch were these 2 surprise Silkies from mail order eggs a friend gave me. 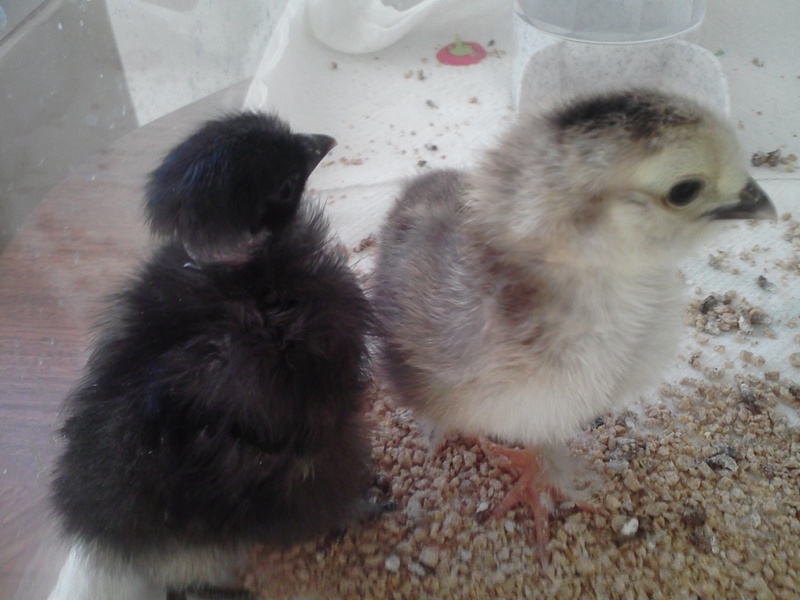 These are 2 firsts for us, a lovely “Showgirl Silkie and a Partridge Silkie.” I believe that is her color anyway. They are now 1 week old.